He was born on 12th of December 1981 at Chandigarh to Yograj Singh, a former Indian Fast Bowler and Punjabi Movie Star. Yuvraj began playing Cricket at quite an early age, and as the Captain of the Under-19 Cricket team of Punjab in the final match of Cooch-Behar Trophy 1999-2000, scored 358 runs against Bihar Under-19 Cricket team. After this, he was also a part of the Under-19 National Cricket team that participated in Under-19 World Cup Cricket tournament held in Sri Lanka in January 2000. Mohammed Kaif was the Captain of the Indian team, which eventually won the championship. Yuvraj Singh made his debut in the One Day International (ODI) Cricket with a match against Kenya played on 3rd of October 2000 at Nairobi. Although he didn’t get a chance to bat in the match, he took no wicket and gave away 16 runs in the match. 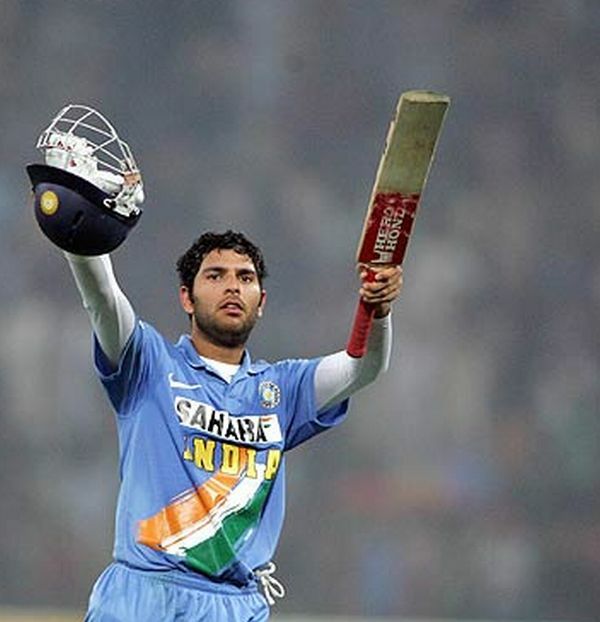 In his next ODI match against Australia just 4 days after the debutante one, Yuvraj showed his batting prowess by scoring 84 runs off just 80 balls. He began his Test Cricket career with a match against New Zealand played on 16th of October 2003 at Mohali. He scored 25 runs in the match, including 3 Fours and 1 Six. Basically Yuvraj is a Left Handed batsman and often he bowls as a Left Arm Orthodox Spinner. He is considered to fare better as a batsman facing Spin Bowlers in comparison to Fast Bowlers. Yuvraj is also said to be one of the efficient fielders the Indian Cricket team has got, and according to a study he was the 4th ranked fielder in the world in terms of having maximum number of effected run-outs in One Day International (ODI) Cricket matches between 1999 and 2005. In the 131 ODI matches he played during the tenure, Yuvraj as a fielder made 21 run-outs possible. In his overall Test Cricket career till April 2009, Yuvraj Singh has played 28 Test matches in which he has scored 1387 runs including 3 centuries and 6 half-centuries, with an average of 35.56 runs and a highest score of 169 runs. He has managed to grab 7 wickets giving away 316 runs with an average of 45.14 runs in these matches. As far as his One Day International (ODI) Cricket career is concerned, he has played 232 ODI matches till April 2009 and has scored 6850 runs including 11 centuries and 40 half-centuries with an average of 37.43 runs and a highest score of 139 runs. In these matches, he took 72 wickets and gave away 2849 runs with an average of 39.56 runs. Yuvraj Singh is the Captain of the Kings XI Punjab team of the Indian Premier League 2009, and in a match against Kolkata Knight Riders played on 21st of April 2009 at Durban, he scored 38 runs off 28 balls, although he couldn’t get his team the victory in the match, as Kolkata Knight Riders won by 11 runs.